MARGUERITE CARLSON PASSES - It is with great sadness that we announce the passing of Willard Carlson's mother Marguerite. She passed peacefully the morning of March 22, 2016. She was buried in a family graveyard at Blue Creek, Saturday, March 26, 2016. Marguerite was an Indian Doctor, protector of the river, fighter for Native American sovereignty and rights. Marguerite played a key role in the formation and progress of Blue Creek Ah Pah Traditional Yurok Village. A photo of Marguerite at the dedication of the village can be found here. Click here for her obituary. SAD NEWS - Haskell Wexler, volunteer videographer of the Wounded Knee: A Line in the Sand documentary, has passed at the age of 93. Rest in Peace Haskell, yours was a life well lived. Read more about Haskell Wexler and WOUNDED KNEE: A LINE IN THE SAND. ALERT - Thank you so much! the video project raised $63,711!! Crowdfunding works! BUT, we still need more because the scope of the project has widened. The video project now will include Standing Rock. Please, if you are able, click here and make a donation to help us complete this project. Thank you. Here's a link to Kickstarter and WOUNDED KNEE: A LINE IN THE SAND. Check out the Huffington Post article, 1890 and 1973: Do We Really Know What Happened at Wounded Knee?. We have a new video of the village project. 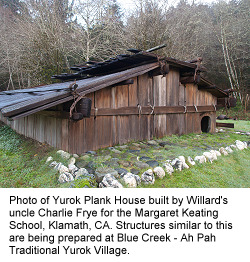 Click here to view and download Reviving the Old Ways: Blue Creek - Ah Pah Traditional Yurok Village. In case you missed it, the New York Times has published a very nice article about the village project- A Vision of Reviving Tribal Ways in a Remote Corner of California. The project is dependent on volunteer labor and donations. Your donations are greatly appreciated. Thank You! 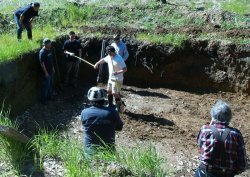 Thanks to the hard work of the crews from the Northern California Indian Development Council (NCIDC), Klamath River Early College of the Redwoods and Dell'Arte, funding from Alliance for California Traditional Arts and the help of many volunteers, the Brush Dance Pit is nearly complete. We've added some new photos of the work - more photos and video to follow. Thanks to all for your support of and interest in the project. The earth and its peoples are facing multiple threats. Indigenous people always suffer the worst during these times. The Yurok people are threatened from without by the effects of climate change, diversions of their waters, collapse of the Salmon population, unaffordable energy, global economic troubles, land takings and misuse, peak oil, peak water. They are threatened from within by drugs, alcohol, cultural disintegration. The Yurok people once lived within a network of sustainable self-sufficient villages. Our village will find solutions to today's problems and their effects and serve as an example for others to follow through becoming ">self-sufficient and sustainable, cultural preservation and renewal, community building, ecological stewardship and individual renewal and healing. Click here for our complete mission statement. The village would focus upon rehabilitating the land, forests, river, salmon, ecosystems, habitat, culture, traditional and spiritual values, and the people. Not only Yuroks, but other people as well, would come and renew their cultural and spiritual roots. The village will eventually be self-sustaining. The village would become a center for exploring various ways, both traditional and modern, to become self-sufficient and sustainable in such ways that are guided by, as well as enhance, the traditions and spirituality that are at the center of the Yurok lifeways. Once built, it would become a model for others to follow, building more villages upriver and downriver. Click here for the complete overview and history. Recently we received a generous grant from the Northern California Indian Development Council (NCIDC). 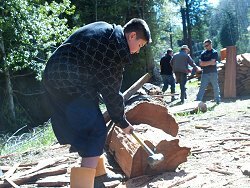 This grant has made it possible for us to bring students from the Klamath River Early College of the Redwoods to learn traditional skills as they work on the Brush Dance Pit. 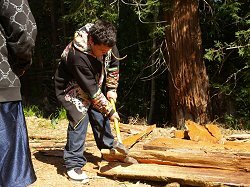 The students come each Friday afternoon from January 16, 2009 through May 15, 2009 and work with several Yurok elder / mentors. Click here for photos.